Waterstone developed the Central Gulf Coast (CGC) Groundwater Availability Model (GAM) for the Texas Water Development Board. The GAMs are part of an initiative by the TWDB to develop state-of-the-art, publicly available numerical groundwater flow models to provide reliable information on groundwater availability in Texas. The GAM will provide reliable, timely data on groundwater availability to the citizens of Texas to ensure adequacy of supplies or recognition of inadequacy of supplies throughout the 50-year planning horizon. Waterstone , using a team of hydrogeologists, geologists, GIS and database specialists and other personnel developed the conceptual model, the structure, collected hydrologic parameters, evaluated system stresses and characterized boundary conditions. The active model domain covers an area of more than 23,000 square miles and consists of four primary structures, three aquifers and one aquitard. The model was calibrated using both steady-state and transient data including well test data for hydraulic properties, pumping as the primary system stress, spatially distributed precipitation, stream-gage data, land coverage and temperature. The calibrated, verified model will be used to assess long range water-supply planning and the potential impacts of climatic variations including droughts. Waterstone is providing technical and expert witness support related to mine closure and closeout planning, and regulatory driven negotiations for two large porphyry copper mines located in southern New Mexico. Various supporting studies were conducted, included groundwater and surface water flow and quality modeling, mine materials characterization and acid rock drainage prediction, stockpile infiltration and mass loading evaluation for alternative stockpile reclamations, and a leach solution drain down analysis. The staff also prepared and delivered key expert witness testimony and develop exhibits for the mine permit hearings. Presented hearing issues to the Senior Science Advisor for the Governor of New Mexico and to state regulators. Total Maximum Daily Load (TMDL) Regulations , NM Environment Department, Red River, New Mexico, U.S.
Waterstone's staff managed a TMDL (i.e. Clean Water Act provision) project involving a watershed impacted by mining/natural metal and sediment sources. Development of numeric targets and biological criteria for attaining the designated use (cold water fishery) of the Red River and developing a plan for implementation of best management practices to set load and waste load allocations. This also involves GIS analysis of watershed parameters and surface/groundwater flow and geochemical modeling to calculate mass loadings and attenuation along the impacted reaches of the river due to metal and sediment loading from tributaries and groundwater springs. The draft TMDL report was be delivered to and reviewed by the NM Environment Department and the EPA and was subject to public comment and hearings. Waterstone has been participated in four separate projects dealing with the characterization and numerical simulation of the Loa River aquifer in the vicinity of Calama in northern Chile. 1) As part of the financial application for the mine, Waterstone performed a review of other consultants' reports, reinterpreted the data and prepared a Hydrologic Feasibility Study. 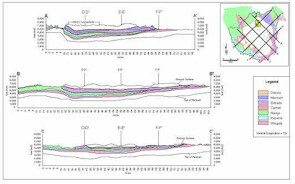 2) To determine the long-term behavior of the aquifer under proposed pumping conditions, Waterstone designed a 3-month long, multi-well pumping test, interpreted the data and developed a conceptual hydrogeologic model of groundwater flow. 3) To refine the conceptual hydrogeologic model, Waterstone oversaw the collection of geophysical data and reinterpreted the local geology. 4) Waterstone designed, built and populated a GIS of all hydrogeologic data of the site and is overseeing the construction of a numerical flow model. All work was done collaboratively with Chilean consulting firms in Spanish. During phases 3 and 4, Waterstone presented results to, and developed work plans with the Direccion Nacional de Aguas, the national agency responsible for water rights allocations. Waterstone has participated in numerous hydrogeologic evaluations at Black Mesa. Projects have focused on local and regional characterization of the aquifer systems. Supporting studies include: groundwater flow modeling; surface water modeling; sediment transport modeling; geochemical characterization and fingerprinting of various source waters; studies of soil and water; and studies of biologic and faunal systems supported by the groundwater-surface water interactions in the arid southwest. Waterstone's responsibilities have also included the reclamation and bond release processes, interactions with federal agencies, Hopi and Navajo Tribes, and tribal agencies (BIA), litigation support concerning water use issues. Hydrology support was provided on the Little Colorado River Adjudication process, investigation of alternative water supplies, and climatological and recharge studies. The Baker et al. v. Motorola et al. litigation is a well-known class-action toxic tort lawsuit involving the release of TCE from three sites in the Phoenix area. The West Osborn Complex in West Central Phoenix is one of the three sites named in the lawsuit. A key defendant from West Central Phoenix retained Waterstone to provide litigation support and expert witness testimony. This complex case was centered on forensic 3D groundwater flow and contaminant transport models prepared by Waterstone and the plaintiffs' consultant, with the purpose of determining the history of TCE releases to groundwater by the various operators of the WOC. Waterstone compiled and reviewed available site data, constructed a GIS database for data retrieval and graphics production, and developed and calibrated a complex three-dimensional flow and transport model. Expert witness testimony was provided by Waterstone CEO Ms. Carla Johnson regarding site conditions, the Waterstone model, and three different models prepared by the plaintiffs' consultants.